Dodgeball Anyone? 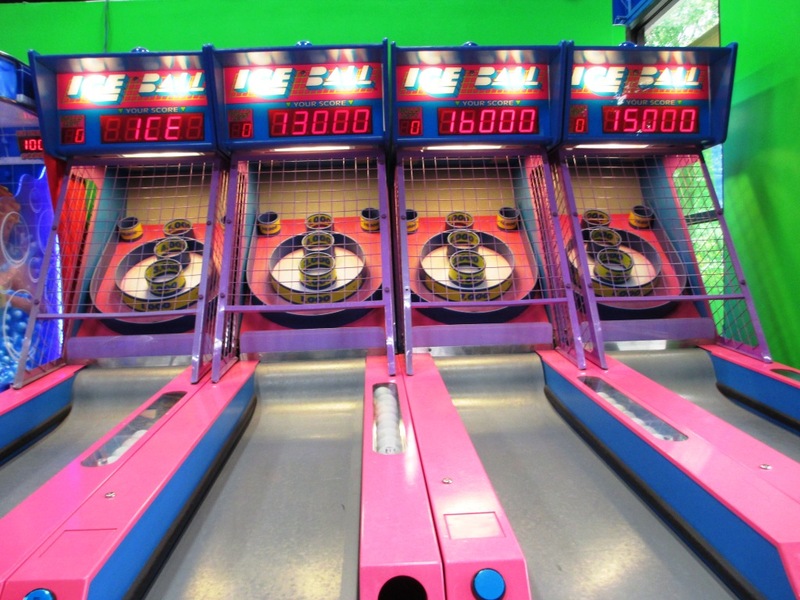 You Can Play It at AirHeads Trampoline Arena in Orlando, Fla. I was a bird. I was a plane. I was David Lee Roth from Van Halen’s 1984 video for “Jump” during a recent trip to AirHeads Trampoline Arena in Orlando. It doesn’t matter I’m a childless, 40-something-year-old. Bouncing from trampoline to trampoline to trampoline was insanely fun, an incredible workout, the perfect sleeping aid and perfect prescription for reconnecting with my inner child. Dang, I was tired when I got back! “I lost a pound!” read the text my friend Val she sent the day after our visit. 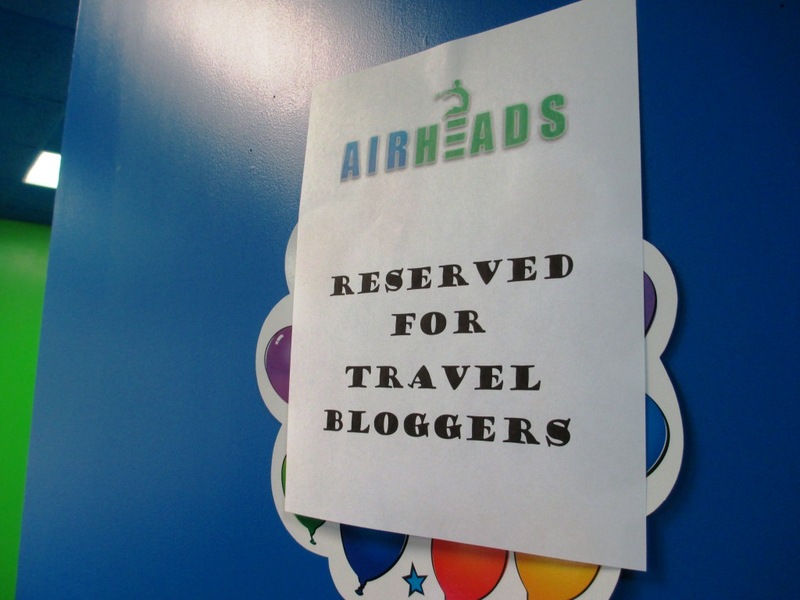 I was invited by AirHeads to attend a travel blogger event and although I’m very comfortable traveling alone (not lonely) I thought for this trip it’d be a good idea to bring someone… just in the event I’d be judged as the creepy old person. My niece and nephew would have loved bouncing on the trampolines, although my nephew is in teen years where he doesn’t admit joy in such things, and since they live in New York, I needed an adventurous friend to join me. 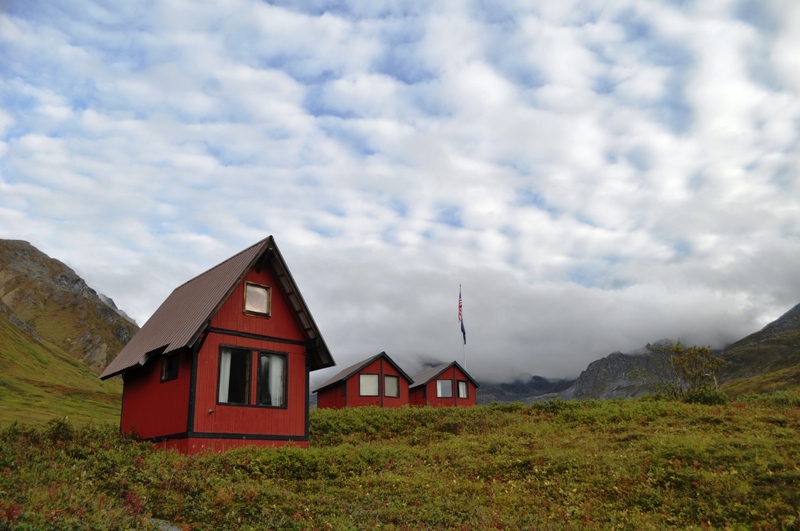 We Travel Bloggers Had Our Own Room! That would be Val. 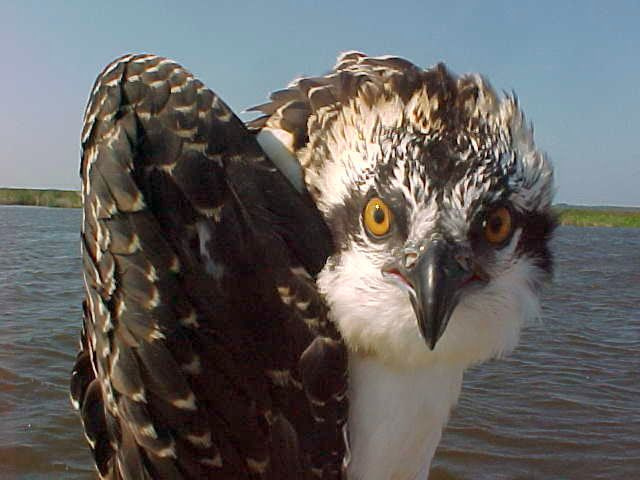 We were college roommates who randomly ended up living on Florida’s Gulf Coast and she’s always one up for the odd and wild. 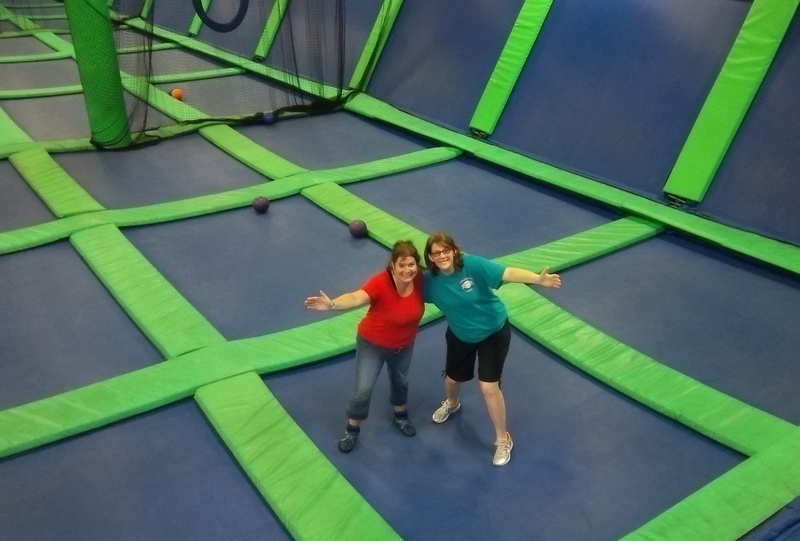 Bouncing around on indoor trampolines definitely fit the bill. As to what to wear, I wasn’t sure but ended up with jeans and when I do this again, I’ll wear something with a little more flexibility. Of course I ensured I had as much Spanx-like material underneath for a little extra support. As for my feet, sneakers seemed to be acceptable or they do have jumping shoes with flexible soles and ankle support. Just bring your socks. And since you’ll be sweating, keep hydrated! Bounce after bounce, the smile on my face broadened. I couldn’t believe how much fun this was but after 15 minutes, I was already winded. I then learned AirHeads offers fitness classes and in an hour class, participants burn up to 1,000 calories! We were shown some exercise moves, in which a woman in her 70s is a regular class participant, and although I can easily perform them on solid ground, doing them on a trampoline really added the resistance and required coordination for balance. Exercises included squats, crunches, lunges and push-ups. Of course, it was fun jumping as high as possible then sitting down and attempting to land on my feet. In addition to trampolines, there are basketball hoops and a couple staff members showed off their amazing dunking and leaping skills. There are also colorful balls for dodge ball, although I advise against randomly throwing them at kids you don’t know. Creepy! With a Little Practice, Someday I’ll Be Able to Fly Like Him! It’s not all bouncing at AirHeads, they have quite the extensive gaming area with activities as interactive video games, skee-ball and those games with a giant claw grabbing for prizes. Collect tickets to redeem for goodies, like fun vampire teeth! They also have very tasty pizza and wings. Remember, I’m a Buffalo gal so I know my wings and these were delish. The pizza exceeded my taste bud expectations, too. Yum! Party rooms are available for private gatherings, such as birthdays and other celebrations. 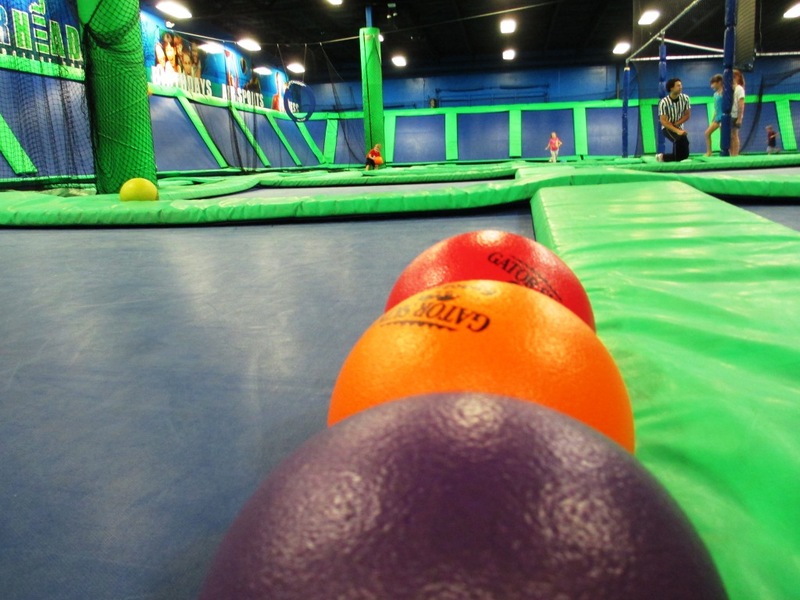 In addition to fitness classes, AirHeads also offers dodgeball, Teen Nights (I guess this takes the place of the roller rink I grew up with as a teen on Friday nights), and Spirit Nights – an opportunity to fundraise for your event. 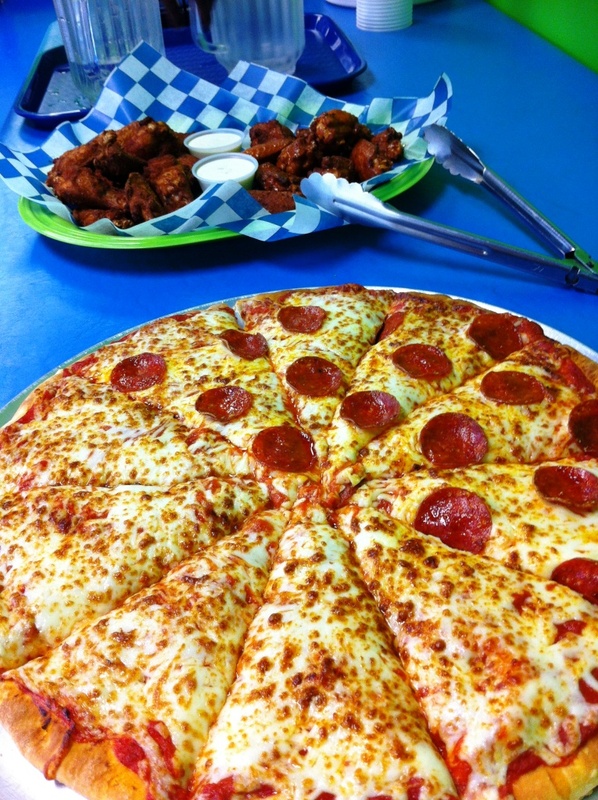 Mmm, Pizza and Wings! Pretty Dang Tasty. I Have I Mentioned It’s Fun? AirHeads has a Director of Fun and her name is Chrissy Gaubron. A Director of Fun?! You know this is a happy place to be when they hire someone to facilitate the fun. 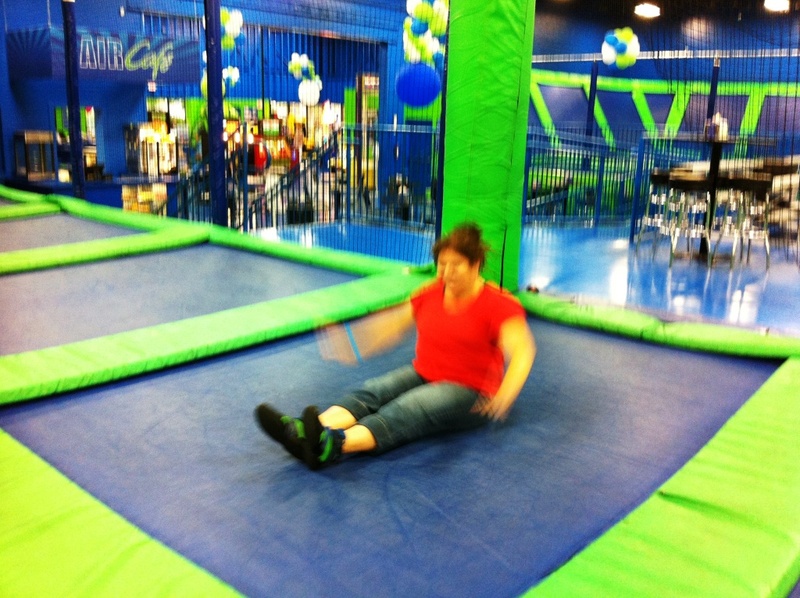 I asked if part of the interview process included giving the trampolines a try but it wasn’t. 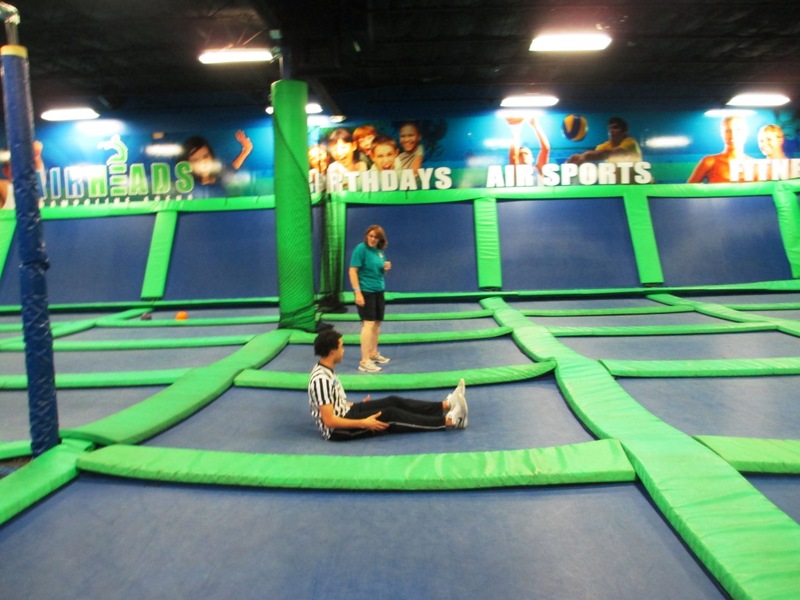 Just over a year old, the Orlando location is the youngest of three trampoline arenas under the AirHeads name. 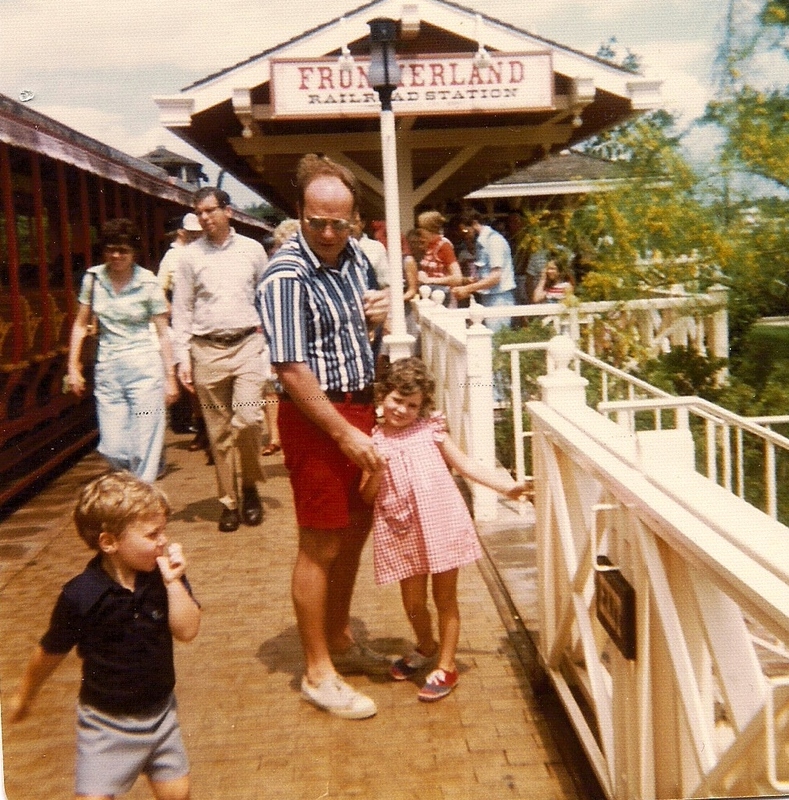 Jim Fosky, Managing Partner was a lucky kid when growing up, he had a trampoline! He told me each of the three locations is set up a bit differently and has hopes of expanding the franchise. 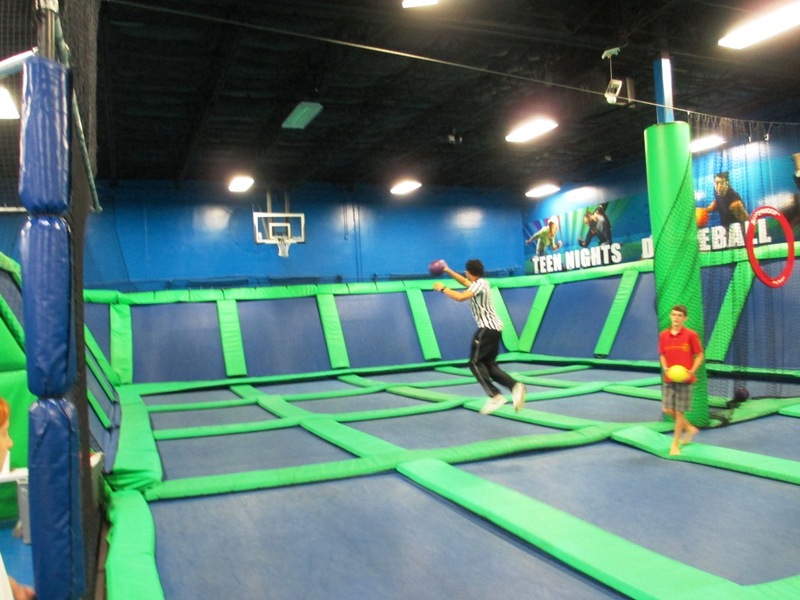 The fee to bounce is $16.95 per person, which is unlimited for the day (as of publication date). This includes access to the trampolines, jumping shoes and helmets for those younger than 18-years-old. There’s no fee to come into the facility, so if you’re with a fuddy-duddy who’s not into having fun, they can sit in the stands, at a table or play in the arcade while your bouncing your heart out. There’s no minimum age (or maximum age) to participate but read over the legalities in the FAQ section of the AirHeads website for specifics including guardians, etc.. A waiver needs to be signed and that can be done in advance through the website. Wheee! Skee-ball at AirHeads Trampoline Arena, Orlando, Fla. 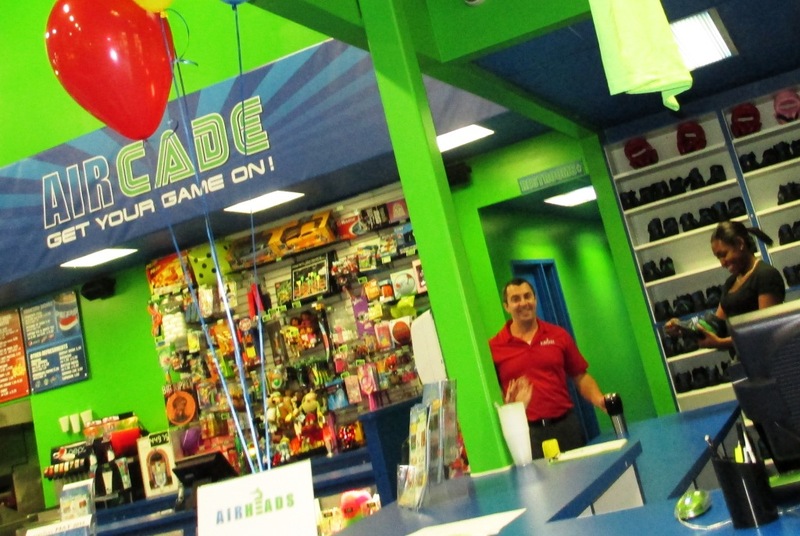 If you’re vacationing in Orlando and Central Florida and need a rainy day activity or just a break from the rush of theme parks, AirHeads is perfect, no matter your age! In addition to Orlando, AirHeads has arenas in Tampa, St. Petersburg/Clearwater (Largo). Hi Jennifer . AirHeads looks like great fun! 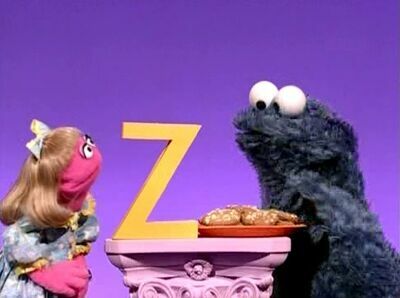 Although I’d have to be careful to make sure I left the pizza until after all the jumping around!